In a recent survey on speakers' use of LinkedIn, over 90% admitted that they could use some help in attracting speaking work by using the business networking site. 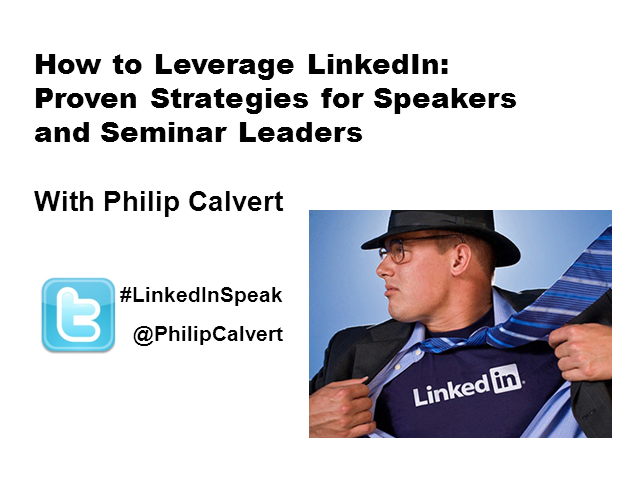 So, in this unique and startling webcast, social network founder and professional speaker Philip Calvert reveals a wealth of tips, tricks and strategies for speakers and seminar leaders to leverage LinkedIn. Philip is the founder of IFA Life - an award-winning niche social networking site, and in this very special webcast he reveals tried, tested and proven techniques that will make an immediate and measurable difference in your visibility on LinkedIn - making you significantly more visible to LinkedIn users searching for people with your expertise. As the founder of a social networking site, Philip brings a unique behind-the-scenes perspective to attracting new customers through social media. His presentations are some of the most popular and highly rated on BrightTALK, and viewers of this webcast are in for a special treat. Don't miss out - Professional speakers, seminar leaders and meeting planners should register now!